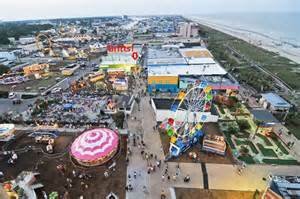 Carolina Beach, also known as Pleasure Island, offers a spin on the past while incorporating modern activities for residents and visitors. From the boardwalk, the live music, multiple festivals and events, miles of beach, world-class fishing and more, Carolina Beach has something for everyone. Unique to Carolina Beach, is Freeman Park, an area on the north end of the beach front that allows 4×4 vehicle access. Residents and visitors flock to Freeman Park to swim, camp, fish, to go boating, crabbing and casting for minnows. Freeman Park is one of Carolina Beach’s main attractions where visitors are able to enjoy the tall sea grasses, wildlife and dunes found only within a coastal community. Carolina Beach is also home to world famous Britt’s Donuts. This slice of heaven, featured in publications all over the country, features homemade donuts made on the boardwalk and is only open seasonally.